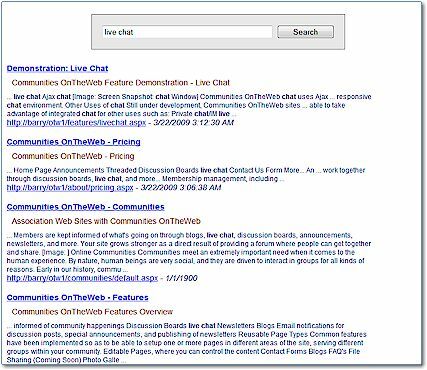 Communities OnTheWeb sites utilize an intelligent search agent. By being fully integrated, and understanding the various types of information that exists within your site, search results are far more targeted than they would be with third-party search. Search results are based on actual page content, not page components such as menus, navigation and other non-content specific components. Search results understand what type of information has been retrieved, so it knows if you're going to a discussion post, newsletter issue, member profile, etc. Search results are filtered on permissions. Users do not see information they are not authorized to access. Search results are ranked to show the most relevent matches first.